Sunday Fish Delish! North African Salmon…. Sharing the recipe love on a Sunday night…..this bad boy is a super healthy fish dish that is rich in just about every-damn-thing that is good for you! If you haven’t used Chermoula before, do yourself a favour and get some, it is a flavour EXPLOSION and is the easiest way to turn a plain ol’ salmon fillet (or chicken breast, pork/lamb/beef fillet) into something worth writing home about. Chermoula is nothing scary or hard to find – it is a spice mix from Northern Africa that you will find in most supermarkets and spice sections in other grocers or health food stores. The mix does vary and I would advise trying different ones to find one you really like. I served my salmon on a warm mix of brown rice, lentils and kale which was delicious on it’s own, but even better with it’s fish-y friend 🙂 The rice/lentil mix adds additional iron, fibre, complex carbohydrates, potassium, beta carotene and Vitamin C to the overall dish, which is already rich in protein and omega-3 fatty acids. Cook the brown rice and lentils together in about 2-3 cups of water – just add the cold water, lentils and rice to a small saucepan and bring to the boil. Turn the heat down and simmer for 30-40 mins or until cooked. Rub the Chermoula into the salmon and put it in the fridge for 30 mins so the flavours can permeate the fish. Pre-heat the oven to 180C. Place the fish into the hot oven and timer on for 12-15 mins. Once the time is up, crank the heat to 220C and cook for a further 5-8 mins. This will ensure the spices on the outside of the fish are nicely toasted. While the fish is cooking, slice the kale and the coriander finely. Add this to the cooked rice/lentils with a pinch of salt and pepper and a squeeze of lemon. Give it a good stir and get ready to serve. Test that the salmon is cooked by gently squeezing the sides – it should look as though it might start to flake if you squeeze too hard. 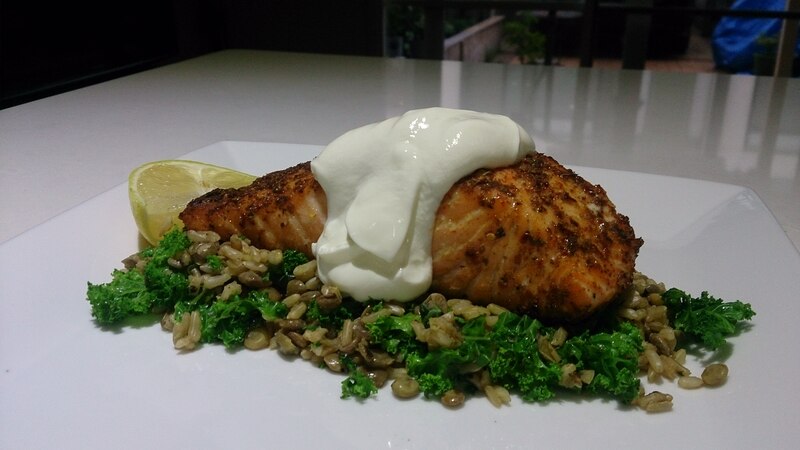 Serve the salmon on top of the rice/lentils with a side of lemon and a dollop of natural yoghurt. I was pretty generous with the rice and lentils here by the way, you will probably have leftovers for lunch tomorrow. Yummo! Have a great week everybody!! This entry was tagged brownrice, chermoula, fish, kale, lentils, omega-3, protein, salmon, spice, Sunday. Bookmark the permalink.